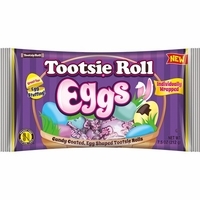 Tootsie roll eggs how fun. These are a new Easter candy the year. You get a chocolate tootsie roll in the shape of an egg covered with a candy coating. A crunchy chewy candy all in one. These are the perfect candy for your Easter basket or to put in your plastic eggs . Each tootsie roll egg is individually wrapped.